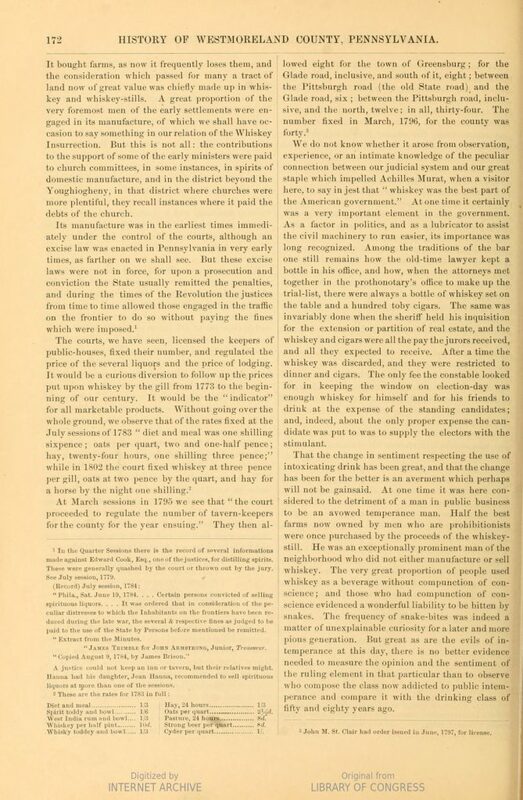 The account of whiskey below in late-1800s Westmoreland County, PA conveys well the social setting in which alcohol found full acceptance in pioneer days. It is from a history of the county (via HathiTrust) authored by George Dallas Albert, published in 1882. Not a little humour is employed too, which adds to the charm. 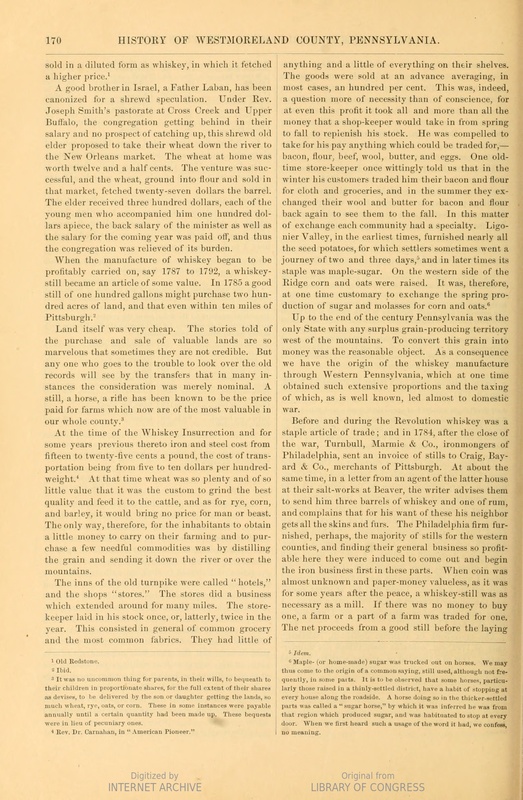 Similar accounts decorate other county histories of Pennsylvania, especially counties set up in the latter 1700s with a strong Scots-Irish presence. The Westmoreland account has a richness and discursiveness the others lack. The settlers came south through the broad valleys east of the mountains and penetrated west through gaps in the hills. Westmoreland County, in the southwest quadrant, was a key whiskey district. So was Washington County, formed from Westmoreland County originally, and Allegheny County where Pittsburgh is, formed from both of these. Fayette and Greene counties encompassed yet more of the whiskey heartland, as I’ve written earlier. The storied Monongahela and Allegheny rivers flow (in part) through Westmoreland to join at Pittsburgh as the Ohio River. Countless legal and other stills filled the riversides with smoke and cereal aromas well into the 1800s, indeed up to Prohibition for some. A romantic vision to many, but not all. Old Overholt rye was one of the most famous productions of Westmoreland, but one of many names. It is still made, in Kentucky now. I once did a vertical tasting of Overholt, the oldest was from Pennsylvania. The oldster was a kind of amalgam of the current one and Lot 40 – if you blended Lot 40 and Beam’s Prohibition rye, that gets pretty close. 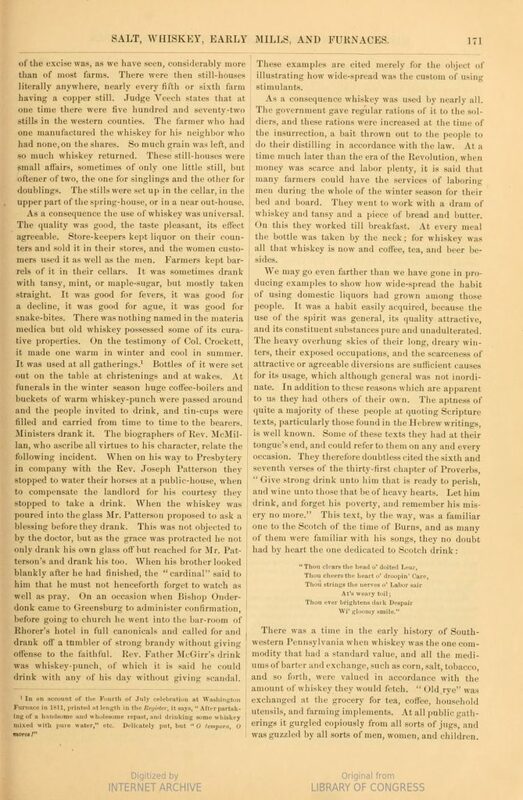 Accounts of whisky in Upper Canadian society before 1850 are virtually identical to these American accounts, albeit less fulsome in the Canadian way. The whiskey was the same compound both sides of the border, confected from rye and corn or other “coarse grains” not deemed suited to bread-making. The whisky was of no great age although even before 1800 “old” whisky was prized, which leaves a question how old, I’d guess a year or two. You even find accounts in Upper Canada for the use of tansy and sugar in whiskey, as appears in the accounts for Pennsylvania. It was one tradition, transplanted here by the American Loyalists. Enjoy the relaxed but informative cadences of the author. It’s different to academic writing today, at least as I glean it from university curricula and scholarly social science and arts journals. Still, denuded of the conceptual framework de rigueur in such writing now, it conveys a common sense reality, one that suggests in fact how liquor operates in the democratic world today. It makes me think Prohibition was promoted by numerous groups seeking their own advantage more than anything else – the pulpit, the medical fraternity, suffragettes, emerging captains of industry. How would we say it in a learned way today? Try this: “It’s how elite or aspirant social groups, seeking to grow or maximize their power, overcame rivalries and negotiated in the public space to alter societal attitudes to alcohol, with implications for public policy extending to legal and other coercive measures”. That could be a doctoral thesis, eh? If I was 25 I might think about doing it. Meanwhile, set a spell, take your shoes off, you all come back now, heah? 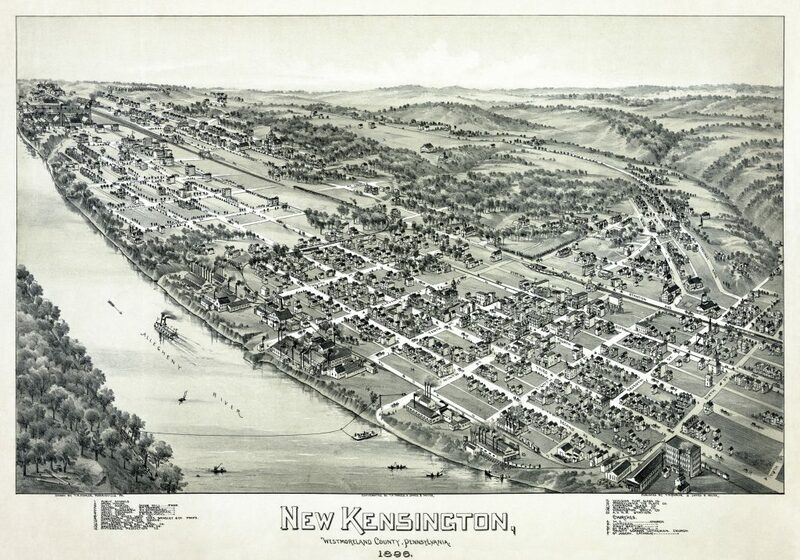 Note re images: the image of New Kensington, PA was sourced from Wikipedia, here. The other images were sourced from the links given in the text. All intellectual property in or to images belongs solely to the lawful owner, as applicable. Images used for educational and historical purposes. All feedback welcomed. Also, don’t give all the credit to the Scots-Irish, which is a common misconception. The Overholts and Dillingers, both substantial and influential Westmoreland County distillers, were of Swiss and German origin and were both Mennonites. Asher Guckenheimer was another prominent and long-lived SWPA distiller whose background was certainly not Scots-Irish. No misconceptions here. Always acknowledged likely early German role but it was more prominent in the centre and east and here I’m talking about the last parts of the state settled where Scots Irish were very numerous, but they were not the only distillers there, nor would I suggest that. Gary, it has been a while since I’ve commented, but this post speaks to the time in question better than anything I’ve read thus far. I’m a Westmoreland County native and am fascinated by the descriptions provided here. We often hear that every farm back then had a still. Not so. I’ve read of one farm in ten having such. and here it is five or six. I’ve speculated that the iron and steel industry in Pittsburgh was founded on early still-building, and that is confirmed here. Amazing! Your post mentions Old Overholt being from Westmoreland, but I must clarify. The Overholt dynasty started in Westmoreland at West Overton, where they manufactured Old Farm Pure Rye. The family also built a large distillery on the Youghiogheny River in Fayette County, where they distilled the same product as at West Overton, calling it either Monongahela or Youghiogheny whiskey. It was not until 1880, after Abraham Overholt’s death, that the whiskey was named Old Overholt in his honor. That product was only ever manufactured in Fayette and lasted until 1951. West Overton closed at Prohibition and was purchased in the 1930s by Helen Clay Frick, Henry’s daughter, to memorialize her industrialist father. It stands today as the last remaining pre-Civil War industrial village in the state of Pennsylvania and is open seasonally for tours, including a museum in the 1859 distillery building. They have also sourced a 50-gallon still and will resume distilling there in 2018. Thanks for your outstanding efforts in researching this compelling subject! Thanks Sam for all you said on all accounts, much appreciated. More coming soon on Westmoreland. Sam also, that oldster Overholt I mentioned was late 40s distillation, so from West Overton.